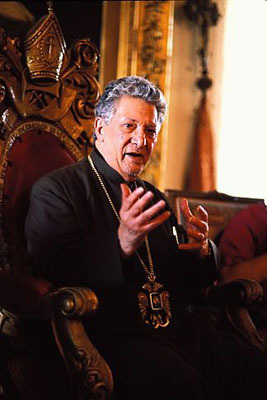 On October 12, 2012 His Beatitude Patriarch Archbishop Torkom Manoogian of the Armenian Patriarchate of Jerusalem, entered his eternal rest in Jerusalem at the age of 93 years old after long years of illness. Rev. Archpriest Zareh Zargarian, Pastor of Holy Trinity Armenian Church invites the faithful parishioners to pray for the departed soul of the late Patriarch. May our Lord keep the Armenian Patriarchate of Jerusalem and its Brotherhood in His blessings and care. Blessed be the memory of the righteous. Honourable Rev. Archbishop Torkom Manoukyan was born in Northern Baghdad (Iraq) on February 16, 1919 and after receiving elementary education at Armenian school of Holy Translators he entered St. James’s seminary of Armenian Patriarchy of Jerusalem. Torkom Patriarch could exert his authority over development of international ecumenical relations. He was a chairman of “Religion in American Life” Council. He also was a member of the council of directors of “Call of Conscience” foundation. He was author of more than 20 monographs including three books of poetry, study on Armenian Divine Liturgy, books dedicated to the Armenian Genocide and detailed guide to the holy places of Jerusalem. The deceased Patriarch was a prominent expert on Komitas.